After spending a few days of fun and sun in Chicago, we returned home late yesterday refreshed and rejuvenated. I had chores to attend to, but was dying to bake and couldn’t ignore the fact we had self-rising flour, red food coloring and buttermilk all on hand at the same time. That rarely happens, so I took advantage of the situation and baked a half of a quick and easy self rising flour red velvet cake. 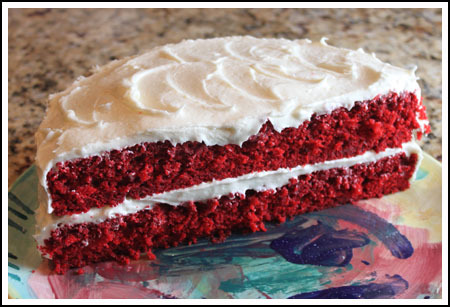 One of my favorite red velvet cakes is made with White Lily Self rising flour, but not all grocery stores sell it. This recipe is similar, but it’s made with regular Gold Medal self rising flour which you can find just about anywhere. It’s also a stir and bake cake, which means you don’t have to pull out the electric mixer until it’s time to make the frosting. I used cream cheese. Since we didn’t need a big cake, I baked this small one in a 9 inch pan, halved the cake, and stacked it to make a semi-circle half cake. My only caution is to make sure your 9 inch cake pan is at least 2 inches high. My 9 inch cake pans are all about 1.7 inches high, so I had to make mine in a 9 inch round springform since it’s the only high sided pan I own. I’m sure this recipe would also be great in cupcake cups or maybe even a loaf pan. Hmmm, now I’m really wondering how a red velvet loaf pan would be, so if you try it let me know! The recipe itself makes a very red (unless you muddy it up with dark cocoa), moist, and flavorful cake. 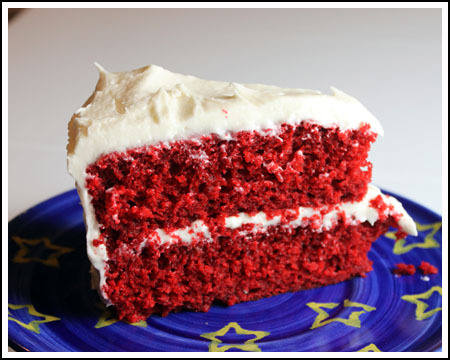 Recipe for a one layer red velvet cake made with self-rising flour. Preheat oven to 350 degrees F. Spray a 9x2 inch round cake pan or a 9x2 inch springform pan with flour-added cooking spray. If you’re using a springform pan, put some aluminum foil under it and bring it tightly up the sides to prevent possible leakage. To make frosting, mix together the cream cheese and butter. Gradually add the sugar. Using an electric mixer, beat until creamy. Beat in the vanilla. thanks for you’re quick answer… I’ll let you know how it works. That’s a good question. One of these days I’m going to try this same recipe with the standard self-rising flour substitute. I believe it’s 1 cup all purpose plus 1 1/2 teaspoons baking powder plus 1/4 teaspoon salt. I’m pretty sure that would work. Hi there ! Your cake looks gorgeous indeed. I live abroad and can’t find self-rising flour here. Can I use regular flour and baking powder ? and how much of each ? thanks in advance for your answer. yummy! It looks delicious!! 🙂 I like your idea of halving a round pan to make a double layer. Genius!!! Did you get to stop at the newly opened Sprinkles Bakery while you were in Chicago?? I leave about 40 minutes from the city and I’ve been tempted to take a trip into the city to get come cupcakes from Sprinkles! This looks delish!!! And the cream cheese frosting is something else. Babette, yes! I am debating on whether or not to post a trip report. My pictures aren’t that great, but we had a lot of fun. The Art Institute was terrific. I didn’t stop at any bakeries, though. We just bought desserts at whatever restaurant we were eating and stuck with our old favorites. Wait,you were in Chicago? Did you go to the Art Institute? What did Fuzz think? I know a “Sprinkles” bakery just opened here, but I haven’t been yet. I can’t believe I’ve still never made a red velvet cake. (We’ll blame that on the hub who doesn’t like cake.) Having a b-day shindig for two SIL’s on Sunday. Hmmm? They like cake. I loved Rina’s cakes that had a little bit of mini cc’s in it. Have you ever gotten her recipe from her? Vinegar/Lemon juice (an acid) help when a recipe calls for buttermilk. Would wine do the same thing? the red velvet looks so rich and intense! Phillygirl, it’s definately quick and easy. Fallon, I am actually going to try the same recipe again as cupcakes, but I might try using bread flour like Cooks Illustrated did with their Ultimate Chocolate Cupcakes. Josie, I wish I’d stopped by Tweet, but I’m sure it’s not near any areas we traversed while in Chicago. I went by “More” (a cupcake place) and Twisted Bakery. Sue, I phrased it funny. It’s “red wine vinegar”. You could use wine, though. It wouldn’t do anything. Dawn, I only half things so we can finish them up and move on to something else. Plus I don’t have a lot of people to share with right now. Tina, it’s red wine vinegar. I should probably re-write that ingredient since I wrote it as “red wine or any type of vinegar”. Confusing. Anna, I have a question. When I looked at the ingredients, I thought you were using “red wine vinegar” but reading the comments someone said the “wine” was interesting . Please clear this up for me. Thank You ! I want to make this soon ,it looks great! That little bit of wine in there is interesting. The cake is really attractive. Anna, you’re my hero!!! I am a Red Velvet fiend. In fact, I have a piece coming to me (via airplane) from Chicago’s Tweet from a friend who is visiting there. Due to arrive next Friday in SF. Best Red Velvet in the history of Red Velvet. Of course, I haven’t made yours yet. That looks delicious. Sounds like it would make great cupcakes!